"We try to do things on our own time, to keep in shape," she said. "But it's not the same as when you're training with your team." Pulecio has represented Colombia in five international tournaments, and last year, she was one of the up and coming stars of the local professional women's league. But the defensive midfielder has barely trained since the season ended last May, and could be out of a job altogether this year as soccer officials contemplate cancelling the local women's league due to its poor economic performance. News that the recently created professional league could be cancelled capped a turbulent month for women's soccer in this country. The month was also marked by sexual harassment complaints against two coaches and claims of poor working conditions for players on the national team. Players are now making a last-minute attempt to save the women's league, while they seek better conditions for the national team, in a struggle that mirrors the ongoing push for equality in women's soccer in the United States. "It's very tough to have your dreams and aspirations just brushed aside," Pulecio said following a news conference in which players urged officials to come up with solutions to save the women's league. She added that cancelling the league "would shatter the hopes of younger girls who are coming up the ranks." Complaints over the management of women's soccer in Colombia started to snowball last month, when two acclaimed national team players published a Twitter video where they outline what they claim are discriminatory practices. Isabella Echeverri and Melissa Ortiz say that for the past two years women's national team players have been denied stipends paid to their male counterparts when they train with the national team. The players also claimed that they weren't paid prize money promised to them for qualifying for the second round of the 2015 World Cup in Canada, and said that on several occasions they were forced to pay for their own plane tickets to make national team training camps, something that is unheard of in the men's game. Ramon Jesurun, the president of Colombia's Football Federation, said in an interview with local media Sunday that it is the first time he heard of these complaints, and has promised to open an investigation. Daniela Montoya, a midfielder for the national team, said she was left off the Rio Olympics squad as punishment for speaking to the media about irregularities. Last week, she provided journalists with a recording made in April 2016 where a Colombian soccer official berates her for speaking out about disputes over prize money and describes her as a "spear in his backside" that had to be removed. The complaints have sparked a national debate on the status of women's soccer in Colombia, where the men's game is passionately followed, while the women often labor in obscurity playing for salaries of around $400 a month. They also encouraged a physical therapist who worked for the national team to disclose details of sexual harassment charges she filed last year against a 70-year-old coach who was in charge of Colombia's female under-17 team. "I pressed charges because I want justice, not just for myself but for the players who are mostly under-aged girls," Rozo said. "With everything that is going on now in Colombian soccer, many of the players are afraid to come forward." Luna denied the charges in a statement, calling them a "sensational" effort to "tarnish" his image. But he has been removed from the national team and is now under prosecution. A player from the same under-17 squad who does not wish to disclose her identity filed separate sexual harassment charges against another member of Luna's coaching staff. As members of the national squad wait for officials to take action on the allegations of sexual harassment and mistreatment, some 500 women who played in last year's local league are stuck in uncertainty. 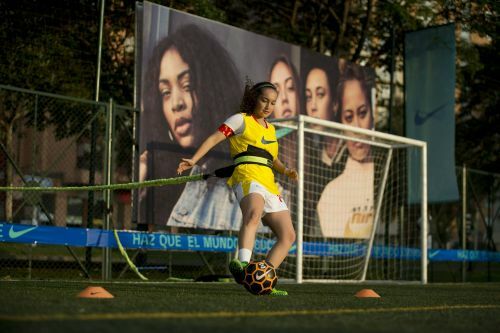 Diego Perdomo, the women's soccer director at local team Atletico Huila, said his club spent about $30,000 a month in salaries for female players, coaches and support staff last year. The club got a small financial break in December after its women's team won the female version of the Libertadores Cup, South America's top club competition, netting $50,000 in prize money. "We only have one company willing to sponsor our female team," Perdomo said, "and support from the media has also been lacking." Players have proposed solutions to save the league that include reducing the number of teams, and using public funds, as well as grants from FIFA, to sustain it. They have also asked Colombia's Football Federation to appoint someone to lead efforts to promote women's soccer. In Bogota, Pulecio said she's hoping the pro league will survive. But she has also signed with an agent, who is looking to place her with a team in Spain. "This league is something we have all dreamt about," Pulecio said. "It would be really sad to end something that generations of players have worked hard to build." What Happens When Youth Soccer Players Stop Using Their Heads?